Limited Pressing to only 100 copies. Wisdom. Suffering. Clarity. Misfortune. Sincerity. 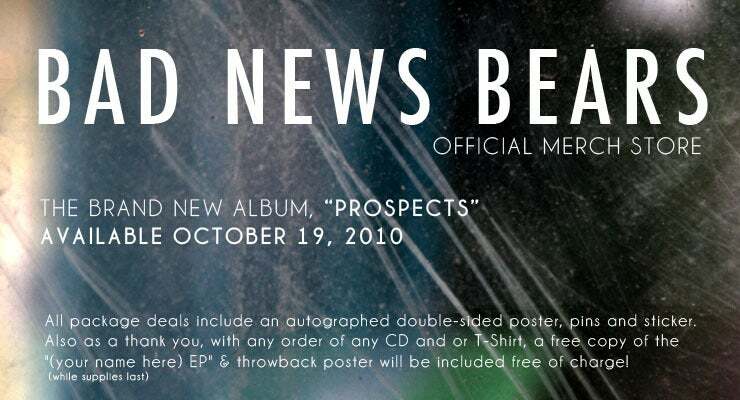 These are all words that describe the world within Bad News Bears new album, "Prospects." Engineered & Produced entirely by Mike Sacchetti within his basement and mixed by Vince Ratti (Circa Survive, The Wonder Years, Days Away), "Prospects" is a representation of growth, struggle, and the actions we take that shape and create the character we undoubtedly become. The demon and the savor. The martyr and the malicious. And at the same time, Bad News Bears' core remains true to itself musically with captivating chorus' and melodic synthesizers. Mike Sacchetti continues to put his blood, sweat, and tears into every inch of Bad News Bears, except this time he is here to stay.